Who are Australia’s anti-racism champions? Here, we recognise their leadership in anti-racism, multiculturalism and Aboriginal and Torres Strait Islander social justice. As a community advocate and an activist, I have worked in mainstream, with migrants and people from all walks of life for around thirty years. I have led the Arab Council Australia as its CEO for more than 15 years; in this role, my advocacy on anti-racism, multiculturalism and cultural diversity has been both reactive and strategic. The Arab community has been subject to decades of racism and bigotry, well before 9/11. And so, combating racism is an ongoing commitment and a primary focus of my work. It is about living and believing in a society where everyone belongs and where all cultures are celebrated. A multicultural society is one where belonging to a particular culture doesn’t give one privilege over others. And multiculturalism is about people being able to be themselves and having a place in society without a dominant culture and minority cultures. For multicultural societies to succeed, there needs to be a prolonged community effort to respect diversity and difference, equally backed by policies that protect vulnerable people from attacks while ensuring that new communities are not disenfranchised. A successful multicultural society is one where cultural diversity is represented at all levels; in the media, in the parliament, in the judiciary, on the board of companies and organisations. How has Australia changed over time? Modern Australia was borne of colonisation and dispossession. It is only in recent years that we have started to recognise and acknowledge the injustice towards Indigenous people. But there is a long way to go. Whilst the White Australia Policy was an article of faith for many generations, successive generations since the 1970s have upheld the idea that besides the first nation peoples, we are all migrants. Today, although there is growing support for inclusiveness, there are groups of people who are quite noisy about keeping to an imagined idea of Australia; an Australia that does not reflect the cultural diversity which is the reality of this nation. In 2008 when the then Prime Minister Kevin Rudd offered the apology to Indigenous people – I was driving as I listened to the apology on the radio; I remember feeling an overwhelming pride in our nation. I remember sobbing and thinking: ‘Finally, we’ve come into our own and things could only get better’. I, like many others around the nation had high hopes that justice for our First People will be restored. After the Cronulla Riots in 2005 – I was in the State Parliament where every single MP stood up and made a statement that condemned the racism and the violence. Our community needed that kind of leadership after the battering it received over the years. In 2014, after the Martin Place/Lindt Cafe shooting and the tragedies that followed – we feared a backlash; we feared the worst. But then Australia acted with messages of support to our community. One example is the #RideWithMe which inspired people to step up and support others facing bigotry in public. Do you have an experience of learning about other cultures? In 1998, my organisation, Arab Council Australia, offered an apology to the Aboriginal peoples of Australia. The formulation of that statement took the people involved in our organisation through a process of learning about indigenous cultures, and in turn we developed strategies that ensured we - board, staff, volunteers, members and other stakeholders - pay respect and honour the traditional owners of this country and to do so in deep and meaningful ways. How could Australia do better in fighting racism? We need our political leaders to not buy into fear mongering and the race-baiting discourse. They need to stop playing the “game” to win political points and stand up for humanity and be authentic leaders. Leave the Racial Discrimination Act (RDA) alone – especially Section 18c. If anyone truly understands racism, they need to understand that the RDA is essential and needs to stay as it is. I would tell her to stay hopeful, inspired and authentic; keep on fighting the good fight, maintain the rage, be bold, stay strong and true to your path and keep on believing that the world can be a better place. We need leadership that will call out the best in Australians and invite us to imagine our communities as places where all people are welcome to belong, contribute and thrive. We need opportunities for long-term Australians and their newest neighbours to get to know each other, to see their common humanity and shared dreams reflected back to them. We need to see an end to Australians rewarding the politics of fear and division and instead start to measure leadership in compassion and the ability to bring diverse people together for the common good. I hope we’ve been able to respond to these needs, celebrate political and civic leaders who’ve moved us towards harmony and tangibly express an example of the Australia that could be. Diversity is a fact. Our workplaces, schools, streets and sporting clubs attest to it. Multiculturalism is a celebration of this diversity - recognising that every person, and every culture, has something to contribute to the common good of the society and future we share. Our national identity is shaped by diversity, giving us a depth and breadth of character that we would otherwise not possess. We not only respect our differences - but we recognise that these are opportunities for us to grow stronger together as we listen to and learn from one another. I am proud whenever I see Australians embrace another human as an equal and see the inherent dignity in those they may have once seen as different. I’m proud every time I see someone use whatever power and privilege they possess to advance the cause of others instead of themselves. Listen, learn and act. Spend time with people of different cultural background to your own and seek to understand their experience. Use your privilege to counter racism and prejudice at every opportunity. Don't stay silent - we must normalise equality and demonstrate that racism has no place in our community. Our leaders could call it out whenever they see it instead of using racism to their advantage when it is politically convenient to do so. What, or whom, do you look to for inspiration? I am surrounded by friends who experience subtle and overt racism every day. I look to them to learn how to be a better ally. I am motivated to play my part in improving their future and the future we all share as people living in Australia. I am inspired by the First Nations Elders who so often invite us to “walk together in a spirit of harmony” despite what the privilege I enjoy has cost them and their culture. I have always believed that advocacy takes place on two levels: both the personal and the professional. On a personal note, I think this comes through speaking with people around these issues and not letting comments pass me by without responding. On a professional, I have always seen discussions around community diversity as a core part of my teaching and education. I present issues in my lectures and challenge the students to confront their own unconscious biases. It does make people uncomfortable – which I think the best teaching does. But if you do this in a safe environment, we arm the students to confront the issues that arise within their own lives and be advocates themselves. Diversity has always shaped who I am – from growing up in a migrant family and negotiating issues around data and racism through my research, to working at the most diverse university in the country in the most diverse region (in possibly the world!). I think Australia has changed in a number of dramatic ways: we have gone from a closed, monocultural to a vibrant multicultural society. It is through this multiculturalism that we are at our best. I am concerned about certain trends – the move to water down the Racial Discrimination Act (part 18C specifically), the attacks on the work of the Australian Human Rights Commission and the Racial Discrimination Commissioner himself, the statements of politicians marginalising specific communities such as young African people and the moral panic of the African Gang threats in Melbourne, as well as the attack on the Muslim Community shows that promoting diversity is a never-ending project. The human condition requires various hierarchies of needs: while we talk about food, shelter and clothing, the fourth dimension that is no less valuable is ‘identity’. That is, your self-worth and where you fit in the world. When targeting an individual, racism and bigotry are acts of violence that undermines the human condition. They target people to make them feel less than human – it is not what a civil society is all about. But more than that, acts of racism and bigotry undermine us all – even if targeting at one section of the community. These acts create fractures in our society – and unless we stand up to anything we witness, these will grow and the very fabric we are will collapse. I believe that the ongoing diversity project has to be grassroots – and it may be a cliché, but my father used to say that you can only get to know someone if you ‘break bread’ together. I would love to see a monthly national ‘diversity lunch day’ – not being about food but about the people you share a couple of hours with. I think knowing people breaks down barriers and creates the opportunity for everyday multiculturalisms. When I was much younger, I went through my own journey of discovery. I was travelling in Bolivia and witnessing a protest by the local First Nations people who had been displaced. In my discussions with some of the protesters I was asked, ‘How do you treat the Indigenous people in your own country?’ It was the first time I had to explain to someone that had knew nothing of Australia about the history of Australia’s Aboriginal people. During that long and intense conversation, it dawned on me at that moment that while I was not personally responsible for the displacement of Australia’s Aboriginal community, we all had a shared responsibility for what had happened, and what should happen going forward. That despite my ego – I am not a unique snowflake – and everything I experience, others have also been through. My work in the anti-racism, multiculturalism and cultural diversity space has been largely around advocating for greater diversity for Asians and other CALD communities in the higher echelons of all work places/professions, for creating more opportunities for leadership roles for people of diverse backgrounds and for recognising not only the value but the necessity of diversity. My work has also been about inclusion, particularly in the sports sector. I am the founder of the organisation Multicultural Women in Sport which aims to create pathways for increased participation of women from multicultural backgrounds in sport for their empowerment, their general well-being and a sense of belonging to the community. I have also worked on issues particular to Asian LGBTI communities and their inclusion not only within the wider community but their own communities as well. As an individual, my belief in the value of diversity reflects in my personal attitudes and interaction with others. I believe that to succeed you need to be proud of your own heritage and confident in who you are. It’s when you value yourself that others value you too. Also, I know that not everyone from a diverse background necessarily wants to take up the cudgel as for them their life in this country may be financially more secure than where they have come from. That makes it even more imperative that people who are able to, take up issues that these people personally would not take up but will hopefully benefit from in the long run. Being born in another country and having had to start a new life in Australia myself, I understand the importance of integration and also strongly believe that multiculturalism is not only about celebrating festivals, understanding the culture, language or cuisine. It has a far deeper meaning and is about inclusion in everyday life, at work and in the broader community i.e. the social, cultural, economic and political life of Victoria. It is about being made to feel the same as everyone and not 'different' whilst still retaining one's social identity and cultural background. I think every sector has a role to play in fighting racism. The government, of course, has the primary responsibility by not just having the right legislation and policies in place for anti- discrimination, inclusion, access, job opportunities and the like but also in being a role model for the right kind of behaviours. Media also has an important role in fighting racism by highlighting positive stories and not sensationalising stories that instigate fear or racial vilification. The recent example has been the ‘African Gang’ stories in Melbourne that were blown out of proportion and failed to address real issues. I look at my own culture (Hinduism) for inspiration. Our scriptures talk about equality (though roles of people differ in society), humanity, respect and tolerance for other faiths and human kind generally, and peace. India is a country of diverse religions, languages, cultures and traditions yet these principles enabled these communities to live in harmony over centuries and the motto there is ‘unity in diversity’. This is not necessarily true of current times due to divisive politics, however if we follow these basic principles, then we are more likely to be a harmonious society. An example of when I used our Hindu scriptures to talk about diversity was at a multi-faith forum on marriage equality and I pointed out that our Hindu scriptures had a role for people from the LGBTI communities, even in temples and kings’ courts and some temples have sculptures that depict gay relationships, I emphasised that we need to go back to our scriptures to understand that it was not a taboo and was an acceptable part of the daily life. My phrase ‘regress to progress’ became quite popular in the marriage equality debate. I also look upon the work of my late grandfather who was judge at one of the High Courts in India. He was known for his socialist outlook and his judgments (that we studied in law in India) reflected that. He believed in the general goodness of people and always taught us to look for that, rather than negativity. Cultural diversity is my life. I’m fortunate to identify with a few cultural identities as well as tell stories of people from different cultural backgrounds. It’s how I see the world and that’s the world I try and communicate through my work. Multiculturalism means embracing and celebrating multiple cultures that make up a community. It’s not about the dominance of one group over another, but rather living with a shared humanity despite our perceived differences. The introduction of the Racial Discrimination Act in 1975, the 1967 referendum. I work in the media, and so reading/watching/listening to as many diverse views and stories as possible is a great way to shift some of the dominant narratives that persist about certain groups of people. Australia could do better by having more conversations about race and racism. Much of the current discourse is centred around what is and isn’t racism, when racism is much more complex than just bigoted, overt racist behaviour. It manifests itself through institutions and policies meaning the outcomes of some Australians is worse than others simply because of their skin colour. I am inspired by people that care about human rights and basic human dignity and find ways of marrying those values with their work. Currently, American criminal lawyer, Bryan Stevenson’s work in criminal justice reform has been very inspirational. South Africa’s former Public Protector, Professor Thuli Madonsela, is a fearless woman whose commitment to justice inspires me greatly as does Professor Gillian Triggs, the former president of the Australian Human Rights Commission. I also turn to the work of filmmakers like Ava DuVernay, Raoul Peck and writers like James Baldwin, Maya Angelou, bell hooks, Ta-Nehisi Coates, Frantz Fanon for inspiration. Just be yourself. You’re enough as you are. As CEO of Access Community Services, a Queensland settlement agency based in Logan, I welcome and settle newly-arrived refugees and migrants and help them fit into the Logan, Ipswich, Gold Coast and Scenic Rim communities. My organisation creates pathways for newly arrived settlers to access the opportunities they came here to have, and be part of the community in every sense – personally, professionally, for their families and for their children. I have always been a part of the Logan community and with 217 different ethnic racial and faith-based groups in this city alone, it is very hard not to be a part of it, both personally and in a work sense. Cultural diversity is not just reflected in the people we settle, it is represented by our staff, our volunteers – everyone who works at Access is a part of that diversity. We understand what it takes both on a personal and work level to be part of a culturally diverse community and be leaders therein and for me it has been the most inspirational work. I was very lucky to have found my passion, which is community work and I love the people who I work with. It is important because we all need to feel that we belong. When we belong, we contribute, when we contribute, we benefit, when we benefit we give back more. It is a reciprocal process and we all need to be able to be part of a society that embodies these principles, whether it is at work, out in the community or at school, there is never a situation where racism or bigotry should be accepted or tolerated. I attended the annual Yuru Festival in 2017 hosted by the Quandamooka people, the Aboriginal and Torres Strait Islander traditional owners of North Stradbroke Island. Yuru, meaning welcome, is a festival where the Aboriginal people welcome the whales into Moreton Bay. As part of this event, some of our newly-arrived refugees and community elders were invited to sit on a panel discussion with the Quandamooka elders to discuss the meaning of ‘Welcome’. The elders all shared their stories of tradition, culture, welcome and respect and it became an emotional moment because it was very obvious that there was so much more that united our cultures, as opposed to what potentially divided them. At the end of the discussion, the Quandamooka elders were inviting our clients and community elders onto their island, saying “you need to bring your family here, I have a house – come and stay with me” as well as “I didn’t know we had so much in common”. It was that sharing of stories and recognition of how much people really do share with each other culturally and personally that really connected everyone. There was a real sense of building friendship, solidarity and unity between the participants and that bond was genuine. We need to have a broader network of people standing with us. The business community and the corporate sector are respected builders in providing that support and leadership. The more we see and hear these Australians lead by highlighting how they are building diverse workforces and how they are directly impacting on the strength of their workplaces and even how it’s contributing to their productivity, the stronger the message that diversity is our strength will become. I look to my parents for inspiration. As the founders of Access in 1984, they represented a generation who came out of a world war, who had to fight to build this Australia. I saw them constantly embracing diversity by welcoming newly-arrived people into the community through their church volunteer work and working for an organisation like Access. I count myself as incredibly lucky to have a lived experience of multiculturalism and cultural diversity. As the daughter of Greek migrants, much of my youth was defined by stereotypes associated with my family and culture, but it’s this experience that I believe has been my most powerful tool in my career of fighting and advocating for diversity and inclusion. If I was to describe my work in the sector, I would describe it as being focused on improving the outcomes of our most vulnerable migrants into Australia. Those who arrive under the hardest of circumstances, as refugees, are overwhelmingly seeking to rebuild their lives and strive for their own successes. I see our job as one of service, helping them to achieve this, with the ultimate goal of fostering independence and self-determination, and in doing so changing the public’s perception and breaking down those misconceptions that cast a negative light on refugees. Personal: It has always been a great asset for me which has shaped my life, but it is only one component, I have multiple identities and these change and evolve throughout my life. To say any one defines me more than the other would not be accurate, my identity is multi-faceted. Work: Cultural diversity is who we are at SSI. Our recent statistics show that within our organisation we have staff who speak over 100 languages and deliver services in even more than that. We celebrate cultural diversity every day and use it as our strength to achieve our goals, fostering connections with the individuals and communities we work with. One of my favourite stories of cultural acceptance happened just a few years ago, where a local Sydney community found common ground with a group of refugees and asylum seeker men through their shared love of soccer. The Newington Gunners and the Holroyd Rangers stepped up to support a group of refugee and asylum seeker men who regularly played soccer around Auburn, but didn’t have the means to register themselves as part of a formal competition. The key message from many of the young men was; “I want to pay soccer with Aussies” and in response I spoke about the young team on ABC radio and within days thousands of dollars were donated to “sponsor a young refugee or asylum seeker to play soccer”. Wonderful frontline SSI staff along with the support of the clubs created two teams, with 26 registering with the Newington Gunners and another team with the Holroyd Rangers. The clubs were able to provide the contacts for sponsors and within an incredibly short timeframe the teams had equipment and uniforms coordinated by SSI so they could get out on the field. The Newington Gunners were even delivered the grand final that year by their newest team and now are part of the Club serving in the canteen, BBQ-ing for the sausage sizzle and have formed strong mutually respectful friendships, breaking down stereotypes on all sides. This really re-affirmed to me what a lot of us know, that Australians are generous and good hearted people, and once we have the opportunity we judge people based on who they are and not what type of visa they have. The most effective way to fight racism is to target the ignorance that fuels it. There are so many voices arguing on behalf of or against multiculturalism that often it’s the voices of the very people being discriminated against that are drowned out. If we give the migrants and refugees in Australia the opportunity to use their own voices to speak for themselves, and LISTEN, they can dispel many of the myths and stereotypes which drive racism. Let us move away from judging people based on their faith or ethnicity or where they came from but rather on who they are and what they do. Therefore let’s all be more curious! What or whom do you look to for inspiration? Nobel Peace Prize Laureate Professor Muhammad Yunus, founder of the Grameen Bank, which helps foster entrepreneurship and empower poor people by using microfinance, allowing them to escape from poverty by building their own businesses. His philosophy that we should share wealth and opportunities is sobering, as we all have a role to play, not just the Gates, Buffet and Bezos’ of the world, many Australians are entrepreneurial and can find ways to give back. As Chair of the Federation of Ethnic Communities’ of Australia I work to break down structural barriers and racism that may threaten to undermine opportunities for CALD people to participate fully in Australia’s social, economic and cultural life. Our organisation works tirelessly to promote cultural diversity, advocate for, and represent the interests of CALD communities across a wide range of policy areas while promoting the benefits of Australia’s multiculturalism. Multiculturalism is the coming together in harmony or in respectful disagreement on a range of issues. It’s about equitable access to opportunities and services. It’s about recognition of difference and including those differences in respectful ways in all aspects of our society and organisations. Australia is culturally diverse because we have welcomed people from all the countries of the world. Australia has embraced multiculturalism in policy and in practice but it is vital that we protect our social cohesion through our efforts to reduce racism and promote cultural diversity. We need to be proactive in further developing a socially just and equitable multicultural Australia. The moments when I have felt proud to be Australian have been moments when Australia has done the right thing in standing up to injustice or in rectifying past injustices. Other moments have been when Australia has set a positive example to the rest of the world on issues of healthcare, scientific achievement and social justice. Individuals should call it when people are diversity deniers. Countering prejudice with facts is fundamental to what we should all be doing to improve our society and strengthen multiculturalism. I believe that our leaders – political, public, media, and educational - should be making a concerted effort to counter narratives which rely on negative stereotypes of communities and individuals of particular backgrounds. They should be openly and proudly rejecting racist ideas and discourses. Without leadership on this issue, not all Australians can be confident that they will be able to access the same opportunities or have the same quality of life as other Australians – for reasons such as the colour of their skin, the language they speak at home, their religion or their country of origin. I most look up to everyday people who are doing amazing things. My greatest inspiration comes from volunteers and community staff who work for little return and do extraordinary things for people, particularly for vulnerable people, everyday. - Be fair to others. - Your ideas and beliefs matter. The Asian Leadership Project is an Australian innovation. As a business, we are first-to-market with our mission to fast-track diverse Asian talent into leadership. Having worked 15 years across the private, public and NFP sectors in Diversity and HR/OD roles, I reflected on my career experiences as a Asian-Australian woman. Not only were my leadership career challenges consistent, it was all too familiar for many colleagues and friends. - Supporting organisations to achieve business growth through culturally-sensitive inclusion and diversity practices. I am proud to be the voice of my members and colleagues in standing tall against racism in the workplace, which may also stem from indirect and/or direct discrimination, as well as bullying and harassment, having experienced this in my own career. Ultimately, I wished this Project existed when I first started my career. This is my contribution to help level the playing field in our workplaces. Cultural diversity shapes my life personally in several ways. I am multiculturally Asian with Chinese Cambodian ancestry, Australia is my country of birth, I am multi-lingual and when in the company of family and relatives, I must observe traditions. In a social context, I am free to be me. Today as a Diversity and Inclusion Specialist, I have a unique lens with how I approach work having been a generalist practitioner. At first, the word ‘Asian’ may sound too specific in practice however I see diverse intersectionality within i.e. Culture, Gender, Age, LGBTI, Abilities, Faith and more. Why is it important to stand up to racism and bigotry? Remaining silent only condones this behaviour. It is unacceptable and disrespectful. I also lend my voice where I observe family, friends and colleagues needing support and, where the power dynamics disadvantage them, I intervene to become the active bystander. For me it’s three - more empathy, curiosity and kindness are needed. The world view is vastly different when you have the lived experience of exclusion and oppression. Study less because you’re smart enough. Instead, focus more on finding your identity and the things you love to do. It is impossible to meet the standards set by your parents. End this pursuit of perfection. Ignore what others think. We are human, so we are perfectly imperfect. Your dreams can and will become a reality. My work has developed in three related ways: a research dimension seeking to uncover the social facts that underpin success and failure in social justice in diverse societies, especially Australia; advocacy for policy and strategies that will increase the creativity and equity that should characterise multicultural community; promotion through teaching and writing of analytical insights that can help people understand the deeper issues underpinning Australian diversity, especially through traditional and social media. As the child of Holocaust survivors and a regular target for antisemitism and racist abuse, I have found myself drawn to situations where conflict about the value of diversity required an intervention and contribution. My professional life has thus been immersed in multicultural contexts, as has my personal life since I first travelled across the world in my twenties. The energy of cultural diversity has been almost a drug, infusing me with wonder and excitement at the enormous range of possibilities open to humanity. More people, more creative energy, more diversity but not yet too much, nor yet too many overall. In 50 years of engagement I have seen the society grow to encompass people from everywhere, though not always justly and safely. Australians still tell themselves stories that are not always accurate, too often pretending to be rather more inclusive than facts allow. 1967 and the Referendum; the Mabo decision; the Vietnamese refugee decision; the opening of Channel O (SBS); helping liberate East Timor; the 2000 Olympics opening; Australia’s role in helping set up the UN. Yes: recently we were in China, and I suggested we take the train from Beijing to Harbin (on a public holiday weekend). I stubbornly refused to take the advice of a grouchy taxi driver. We ended up missing our train, having a horrendous but in retrospect gruesomely funny series of disasters. I learnt that trust is always a useful first frame for listening to people whom are different to yourself. Pass a Multicultural Australia Act with security to institutions necessary to undermine racist discourses, attitudes and values. Decide to develop a way of properly containing racism on line, and cleaning up social media to protect its users from abuse and harm. Concentrate on learning more about your parents’ lives, their reflections and lessons learned. Use fear of the unknown as a guide to what you need to learn, but with a sense of self-protection. Read everything about everything, and start writing early. Learn to play music so you can have another tool to traverse cultures. Manager at PwC Indigenous Consulting and Non-Executive Board Member of Greenpeace Australia Pacific. My work to date has been in the areas of Indigenous human rights, land rights, restorative justice, environmental justice, health equality, reconciliation and Indigenous employment. In all these areas, I do my best to communicate that positive progress will only really be made if those who are affected are actively involved and included in the decision-making. Selling empathy (putting one in someone else’s shoes) is hard though and I have found myself feeling burnt out in this work – the struggle is real and continues, as it does for many others. I am proud of my own cultural identity and mixed family heritage and have always had a strong sense of social justice and value diversity of opinion, knowledge and cultures – there is so much to learn in this life, so many teachers in all areas of society, yet so many people struggle simply because of things that are out of their control. Positive social change comes and goes I think. I think Australia’s true national identity will not be settled until a formal avenue for truth telling about the history of treatment towards Australia’s First Peoples is in place. Progressing the requests of Aboriginal and Torres Strait Islander people outlined in the ‘Uluru Statement from the Heart’ is also unfinished business. ‘The Apology’, which came a few years later when the Australian government finally acknowledged the harm caused to many Aboriginal and Torres Strait Islander families from forced removal. Generations of fostering on my father’s side meant that I have had to find family and still continue to do so. While this has been a daunting and traumatic experience, I was able to appreciate that my family was not alone in this and support was there. There are so many great positive stories to mention… though I was recently inspired by a project which connected young people from the Chumash nation in Los Angeles and young Aboriginal Australians to develop a song about climate change. The song will be launched on 9 August on International Day of World Indigenous Peoples via NITV/SBS. I think education, as early in life as possible, is the primary source to fighting racism. I strongly believe learning from others from various cultural backgrounds, broadens the lens of perspective. The world is big, yet can be so small if one chooses to view others as being less than them. Honestly, my inner circle is relatively small. My inspiration is my family, my partner, our beautiful daughters, and our families on both sides. They are my world. I am also a feminist at heart – there are many strong and inspirational women from various backgrounds that I look up to and draw strength from – life would not be the same without them in my life. Over the past five years, I have developed programs for Reconciliation SA in conjunction with ActNow Youth Theatre on combatting racism in schools. We signed up early to the national anti-racism campaign. I have sat upon the roundtables and Taskforce in South Australia progressing conversations about tackling racism and expanding the reach of the national campaign. Currently I am opening up conversations in Universities around Occupational Therapy, Social Work, Nursing and Health Sciences so that teaching staff and students are prepared in cultural responsiveness. These conversations will affect curriculum, engagement and professional learning standards. As part of Reconciliation South Australia, my life is constantly focussed upon inclusion and acceptance. This extends to Church involvement where our local congregation has campaigned for bringing children out of detention and supports the running of a local Bari School. In work, which translates to a way of being, we are being provoked to think about ways in which racism can be addressed and greater inclusion can be encouraged. The First Peoples of Australia have a very special place as the oldest continuous living culture anywhere in the world. I engage with many people as new arrivals who are more open and interested in understanding Aboriginal culture than people who have been in Australia for generations. There is genuine respect and interest in learning from the Aboriginal culture and stories. People from war torn countries identify with the struggle of the Australian Aboriginal community. It is this cross-cultural exchange that defines multiculturalism for me. His Excellency, Hieu Van Le AC becoming the Governor of South Australia having arrived by boat in Australia from Vietnam in 1977. The 1967 Referendum allowing Aboriginal people to be counted in the census for the first time. Gough Whitlam pouring sand into Vincent Lingiari’s hands as he acknowledged the land and its traditional owners. Recently I had the privilege of leading a Reconciliation Trek on the Kokoda Track. The openness of young Aboriginal Australians sitting with their Papua New Guinean “brothers” was awe-inspiring. The cross-cultural components of the Trek were profound and surpassed expectation. To see a young 15 year old Aboriginal girl sitting talking with her Buna brother for over an hour exchanging understandings about families and communities and customs was truly heart- warming. We have got the message out there about Zero Tolerance to racism. The National Campaign Racism. It Stops with Me has supported this zero tolerance agenda. However, casual or covert racism which can be seen as the constant insidious ‘drip, drip, drip’ of the undercurrent of racism does not and will not respond to an anti-racism message. This leads to the conclusion that we need a new, parallel, resourced campaign of inclusion to address the unintended consequences of jokes, judgement and exclusion. When delivering the Reconciliation SA/ActNow schools program, a young 13 year old summarised the program by saying, “today I learned to be an up- stander, not a bystander!” I find this advice to be perceptive and wise and I’d like to give my 13 year old self the courage to take the same stance. I look at race and multiculturalism from the lens of cultural diversity which aims to continuously focus on the positive contributions of those involved. While calling out racism, my personal approach is to highlight the positive that exists in the majority of Australians that are very inclusive of diversity. So rather than focusing on those with negative attitudes, I prefer to give voice to those that celebrate, engage, and acknowledge multiculturalism and cultural diversity. It enriches who I am and gives me a strong foundation to embrace people that are different to myself. This allows me to create relationships that are based on sincere intentions. Cultural diversity helps me to acknowledge my own heritage, as well as my faith, enabling me to not only be a mentor to others, but to also walk side by side with all people. Those who are similar to me, as well as those who are different, acknowledging that we are all Australians, and that we are all equal. I think multiculturalism is more than just a word. It is an active process of knowing who I am, and is made up of many parts to create a whole. It is more than people just sharing meals, attending cultural festivals, and dressing a certain way. It is actually being able to sit at Cronulla beach where every Australian can feel safe, secure, and able to have fun regardless of whether they are wearing a burkini or a bikini. Multiculturalism to me is where people can really feel comfortable enough to enquire about another person’s culture without being fearful of offending. In a nutshell multiculturalism is about being honest and sincere in a trusted safe environment as Australians. In 1992 when the High Court delivered the Mabo decision to acknowledge that the land of Australia was not terra nullius. This made me feel proud to be an Australian, and to have belong to a country that acknowledged the heritage of the land. In 2001 when Marie Bashir became Governor of NSW. As a woman of Lebanese background, that gave hope to many young women who come from diverse backgrounds. In 2008 when Prime Minister Kevin Rudd apologised to the Stolen Generation. Again, this was a moment in history that I had been waiting for since I had learnt about the Stolen Generation as a young girl. I could not fathom why it had taken to so long to apologise, and I felt proud when we as a country, finally did. In 2011, we hosted an international Muslim scholar in Sydney and one of the highlights of the tour was a guided visit to the Blue Mountains in NSW by Aboriginal elders. We organised a group of Muslims, men and women, accompanying the Muslim scholar to visit the Aboriginal community in the Blue Mountains. We spent the whole day from sunrise to sunset together. We prayed together. We ate together. We sat quietly and we had deep conversations. The Muslim International Scholar spoke no English, but he communicated fluently in an unspoken language with the group. A lot of tears shared, a lot of laughter. At the beginning we had interpreters but within the first half hour or so, the leaders were communicating with no interpreter whatsoever. They showed us sacred sights and learnt about each other’s connection to sacred spaces around the world. It was an experience that has resulted in everlasting friendships with our Aboriginal brothers and sisters. Believe in your ability to be the best that you can be. Continue to dream, for dreams eventually do come true. It is ok to make mistakes, but it is more important to learn for those mistakes, and to see them as challenges that you will overcome. Being different is a good thing, you don’t have to conform to what other people want you to be. Be proud of your heritage and your faith. Sit with elders and learn from them. And finally, be proud of who you are. I am an advocate for greater gender and cultural diversity in leadership. Just as we know that greater gender diversity in leadership brings better performance, so does cultural diversity. A McKinsey report in January 2018 shows again that greater gender diversity leads to a 21% outperformance on profitability whilst companies in the top-quartile for ethnic/cultural diversity on executive teams were 33% more likely to have industry-leading profitability. As a Director of Diversity Council of Australia, I am able to support an organisation working to expand the utilisation of talent of all forms of diversity in Australia’s leadership. The fact that we are not fully utilising the talent and capability of all Australians means we are inherently limiting our prospects for growth over the long term. As a culturally diverse woman who has lived in Australia almost her entire life, I have an appreciation of my ethnic heritage and its complexities as well as an understanding and love of the Australian culture. I find the integration of both enables me to help others understand and build bridges between the two. Multiculturalism is not an assimilation of other cultures. It’s a respect and understanding of differences and valuing those differences to create a greater whole. Fundamentally, we are all human beings and often it is easy to see difference and not know what to say or behave. I understand that it can be daunting meeting someone who looks completely different and have different cultural practices. However, many times I find that there are more elements we have in common than we see as difference. Love, family, security, hope, dreams, belonging are common regardless of ethnicity – elements that make us part of the human race. The issue around cultural diversity normally focuses on needing people of different ethnicities to assimilate into the status quo. Except with any relationship, it needs both sides to reach out to be inclusive of the other. Just as we have Male Champions of Change for gender diversity because they sit in positions of power to make a difference, we need people of Anglo-Saxon background to champion cultural diversity because they sit in positions of power to make a difference. Right now, we need all people but particularly people with power and influence to just care about the issue. I would like to leave the world a better place. When looking for inspiration, I often look at people who have taken risks, fallen and gotten back up again because they inspire me. I truly wish we lived in a world in which our differences didn’t define us or divide us, but the reality is that they do, so my advocacy has always been about normalising difference, or rather normality. I am passionate about helping to create a level playing field so that each Australian, irrespective of their ‘difference’ can access an equitable opportunity to reach their full potential. Growing up with a hyphenated identity meant that I was very conscious of my place in the world. If I am very honest, I loathed my differences. I so desperately wanted to fit in but no matter how much I tried, my skin was still a darker shade than most of my fellow students and my name was not Jane. Now as I reflect on my past, I am appalled that I felt such a sense of shame about my identity and I want to fight tooth and nail to make sure no other young migrant child feels like that again. If you think about it, each of us has multiple cultural identities and we ultimately draw our heritage from various parts of the world – so really we are all multicultural. It’s unfortunate that in recent times, multiculturalism has become something of a dirty word. Given that none of us had a choice in the circumstances surrounding our birth, ethnicity, gender and social status, these attributes should therefore not determine our destiny and yet sadly, decades of research very clearly highlight that they do. It’s easy to stigmatise and demonise a group of unknown people. Imagine the sick feeling you would get upon realising that a member of your own family is being demonised in some way. Now extend that feeling to the rest of humanity – if prejudice and discrimination is not something you would tolerate when it comes to our own family, then it shouldn’t acceptable for others. The standard you walk past is the standard you accept, so use your respective levels of privilege to speak up for those who are less privileged. My mother – she's compassionate, resilient and an extremely determined woman. It’s only in my adulthood years that I came to realise what an extraordinary influence she has had on my life. She often reminds my siblings and I to make the most of the opportunities that we have before us, opportunities that she could only dare dream of, back home. She's made countless sacrifices for my siblings and I and in difficult times, I ultimately draw strength from her. I have just completed four decades of work in developing and implementing policies and a range of culturally and linguistically appropriate services/programs to achieve desired objectives in relation to the above within commonwealth and state agencies and the community services sector. My advocacy work has involved promoting legislative safeguards with regard to anti-racism, holding political leaders and media personalities to account, and vigorously questioning mindless mainstreaming. In many different ways. My wife is from Malaysia and of Tamil background and I from India of Malayalee background and we speak each other’s languages and others. The partners of our Australian born sons are a sixth generation Smith and a second generation part Lebanese and part Egyptian Australian. We have three grandchildren whose cultural heritage is more diverse than their parents and us. As the CEO of the Multicultural Services Centre of WA I have the pleasure and privilege of working with 130 staff, all but three born in Australia and all but three being bi/multilingual and between them speaking 68 different languages. This has enabled MSCWA to provide culturally appropriate services in the preferred language of the consumer. A society that practises fairness, is committed to eliminating discrimination in all its forms; and one in which regardless of one’s place of birth, one has equitable opportunities to achieve their full potential. The historic moments after I migrated to Australia in 1978, including Malcolm Fraser’s adoption of and implementation of the Galbally Report; the establishment of Medicare; the High Court’s Mabo Decision; Reconciliation Walk across Sydney’s Harbour Bridge, which I was privileged to participate in; National Apology to the Stolen Generations by Prime Minister Kevin Rudd; Julia Gillard becoming the first female Australian prime minister and her famous Misogyny speech; and the Marriage Equality Act. Never be a bystander. Always speak out regardless of the consequences, real or imagined. After 40 years in Australia, I am still often asked where I am from when I meet someone for the first time. My response of ‘Dianella’ evokes a stunned look and words to the effect of ‘I meant before that’, to which I would respond, ‘if you have enough time I can tell you about the other 10 suburbs I have lived in’. Australia can better fight racism by adopting a national charter or bill of rights, and a national multiculturalism act and providing necessary resources and infrastructure to effectively implement them. Make the most of your teenage years and retain the carefree and adventurous spirit for the rest of your life. Nothing is beyond you if you pursue it the best you can. Advocating for and giving voices to people of colour to be heard, empowering individuals - in particular young people - to embrace who they really are and to navigate their unique heritage and dual identities. Supporting young people to obtain the skills needed for leadership roles and building on their advocacy skills. I am a proud person of dual heritage. My parents sacrificed their lives to cross the seas to create a new life for their children. As a result, I live in between two cultures one being Vietnamese and one being Australian. Growing up and being educated in the multicultural suburb of Footscray, Victoria has shaped who I am also. I am actively involved in the multicultural sector for work. I live, breathe and thrive on diversity! Racism and bigotry hurts us all, whether or not you are the victim. Every single one of us other than first nations peoples, are migrants to this country. Every single one of us deserves a chance and opportunity to live life free from discrimination. When you target one group or individual, you target us all. Every conversation matters – we all play a role in making Australia a safe and welcoming place for all. My mother who taught me about empathy and kindness. And to all the women in my life who have mentored, supported and cheered for me. The sisterhood continues to inspire me to do what I do. Love yourself, despite what society tells you. Worry less and know your self-worth! Former Chairperson of South Sudanese Community Association in Victoria Inc. I advocated for 3 years from April 2015 to March 2018 on behalf of the South Sudanese Community in Victoria on issues to do with workplace discrimination, schools, residential tenancies, sports discrimination, and exclusion from services etc. I approach my work and life with a double lens perspective as a result of my experiences in life. I always give the benefit of the doubt and a second chance to challenges or things generally in life. There has been slow progress with multiculturalism and acceptance of the other race groups as part and parcel of our society. Evil flourishes when good people keep quiet, so it is important to stand up. Include people of diverse backgrounds in key government institutions to address social diversity gaps on governance and executive boards or roles. Peace Meals is a great program in the Fitzroy area where people pay for a dinner and many come together to eat and interact over dinner to know one another. Kate Shelton runs this with the support of the law firm Lander and Rogers. There has to be public acknowledgement that racism exits. Without this, society will continue to be in denial. Human beings are one and our differences are by accidents of birth and not our choices. Learn to embrace every human being like your kind. I have been working in Aboriginal and Torres Strait Islander health and education over thirty years. Working in this space has demonstrated that there are many levels of racism from personal to systemic and organisational that target Indigenous Australians and other minority peoples which impact on their opportunities for equitable outcomes in health, education and greater social justice rights. As an Aboriginal health worker and patient I have experienced racism first hand in dealing with the health system and health professionals. Like many Indigenous Australians I live and work in two worlds. One that acknowledges my culture, aspirations, knowledge building and responsibilities. The other world is one that has colonised our land and people, and still does not quite appreciate the gifts, knowledges and strengths of Indigenous Australians. This is the world I provide a two-way education in, building the knowledge of many Australians to acknowledge and respond effectively to the inequitable circumstances of Indigenous Australians. The other way is ensuring safe and supported passage for our person accessing health and education which is a basic right for all. Australia has a black history. Indigenous Australians are the oldest living cultures in the world. Recent evidence found in Victoria at least 85,000 years of Aboriginal custodianship. We have the knowledges and practices to maintain and sustain a healthy planet, and so much more. Continue to pursue equity for Aboriginal and Torres Strait Islander peoples; in the health system, the juvenile justice system, corrections and beyond. Linda Burney, Aunty Beryl Carmichael, Mum, Aunty Isobel Coe. You can do anything you want to do, make sure you get an education. I see my advocacy as part of my identity as a Bama Bagarrmuguwarra. My experiences as a witness and a victim of racial vilification have taught me to engage with the wider community and to use these experiences to create conversation with those who may be misguided, ignorant or racially prejudiced. I am wholly driven by my culture throughout every facet of my life. Although I have received racially motivated abuse and vilification it is through immersion in my culture that I have learned to hold my head up high and be proud of who I am as a young Indigenous man. My culture has provided me with strength, knowledge and compassion and has taught me that I must always consider and respect those around me. While I have only witnessed small amounts of change in my lifetime, I have seen through my family that Australia’s racial prejudice has decreased significantly over the past 100 years. Unfortunately, there appears to have been a notable swing back to the radical over the last decade. There is a national narrative that unfortunately shows that we may be moving towards a more noticeable state of xenophobia despite an increasing majority of Australians who embrace their multicultural and diverse society. The mornings at Dawn on April 25th, side by side with returned servicemen, family and friends, remembering our Diggers, Indigenous and non- Indigenous, makes me feel proud to be Australian. However, the first time that I witnessed the true meaning of the Australian spirit was back in 2010-11 when floods devastated South-East Queensland. I remember 60,000 volunteers trudging down the streets of Brisbane and donation tins going around school. I remember the spirit of our country coming alive as Australians chipped in with no regard for religion, race or background. This moment showed me that when push comes to shove, Australians will be there to help. It makes me truly proud that this Australian spirit exists and continues today. One of the most impactful experiences I have had of sharing my culture with others has come from my family. Despite themselves not having Indigenous ancestry, my Auntie and cousins display profound respect for my culture through their desire to learn together as a family. Few things make me smile more than hearing my cousins call me “Yaba”, the Guugu Yimithirr word for elder Brother. Our nation needs to be constantly reminded of its unique history. We have an Indigenous history, a white Australian history, a migrant history and a combined history through which we have become the multicultural society we are today. To better fight racism and prejudice we need to educate, demonstrate and reflect on our shared history and work together to create a national story we can be proud of. We must strengthen our culture and identity by embracing diversity. A strong Australia is a diverse Australia. When I get asked this, I always stop and think about why I do what I do. I do this to remind myself of what has inspired me to be vocal, to stand up and to try to succeed. I want to do the best I can because of those who have gone before me. I never want to forget the opportunities, chances, experiences, love and help I have received from my community and my family. Looking back at those in my family and communities, seeing all that they have fought for and accomplished, shows me why I need to dedicate my work to those who came before me. Everything you do is leading to something; it’s okay if it’s not what you thought it would be. It’s okay to make mistakes, you can only continue to learn and grow by making them. Always keep your community and those around you close to heart. As a proud Aboriginal woman, I have always promoted anti-racism and discrimination in school, and also when working. Encouraging education on these topics, as well as celebrating diversity is so important, especially in Australia where we have so many different cultures and communities. We have so much to learn from each other, but we need to also learn to be respectful of each other’s beliefs, values, and cultures. Especially in school environments - children should be able to learn and feel included, and not spend all their time defending the colour of their skin, accent, religion, cultural differences, or what they wear. I think there is more support across Australia for multiculturalism, in a non-tokenistic way, but we still have a very long way to go. As a First Nations person, I have been so proud of our people in the arts, advocacy work, and political work. We all have our strengths, and ways of sharing the true history of Australia, raising awareness on injustices and issues happening in different communities, but also bringing people together. I'm so proud to march alongside my elders and community, or having time on country to practice our culture freely. We wouldn't have these celebrations, events, or role models without those before them that did the same. The people before me made sure I had a future that was happier, where I was able to learn language, practice traditions, and hear our dreaming. We have so many influential people to look up to when it comes to making real change, and making our communities a better place to be. Because no-one should have to face racism and bigotry. People have the right to stand up for themselves but also to have some sort of legal backing to hold others accountable. Racism can come in different forms, and it impacts all people mentally, emotionally, spiritually, and sometimes physically. When it comes to racism, discrimination, sexism, homophobia etc., we must continue to call people out. Our young people deserve better leaders and role models. Educate yourself, those around you, and support groups who are minorities and feel not welcome. Don't speak for them, but use your power of privilege to better life for those coming to Australia for safety, our First Nations people, migrant communities, and especially our young people. If you have money, donate it to communities to help, or programs to assist those communities. If you have time, volunteer with groups, or even deliver cultural awareness. Ask your employer what they are doing to make it a supportive and inclusive workplace. We can all create change, one action at a time. Having stronger legislation and policies around racism. Having more funding to roll out resources and tool kits for workplaces and schools - like Racism. It Stops With Me. My family and the staunch women in my life in particular. I have so much to learn everyday from them, and we give each other support, love and strength, especially in hard times, but also in times of celebration. Never lower your voice, make time to do things that are important, make mistakes, but most importantly love yourself and let others share that energy. Largely about workplaces. I’m an employment practitioner, and I’m very committed to policies and procedures, and most importantly, creating workplace cultures that mean that everyone can flourish at work. On one side, our family has been here for more than a century, but we still think of ourselves as culturally diverise, I think in part because we suffered racism in the early days of being here. We had a non-Anglo last name then, and that has very much influenced how we view ourselves in the Australian context. On the other side, I have mixed and Indigenous background, so I see myself as very much a product of the last couple of hundred years of how this modern Australia has developed. It means that in our family we were raised to love cultural diversity, to want more of it, and to promote it. My partner and I have raised our kids the same way. It’s at the heart of our family life. The Mabo decision. The principle of prior ownership of this land is very important to me. It said that we had a High Court that could do the right thing, and this vital principle was established in the law. It could have been the beginning of significant and meaningful reconciliation between Indigenous and non-Indigenous people. Because it is wrong, it’s hateful and it’s just plain nasty. I was raised to believe that nobody is better than anybody, and racism and bigotry go to the idea that someone’s ways are better than others’. It’s simply not the case. And I also think that they are extremely tedious – I think life should be about being open to new things, people and experiences and most importantly, what we can learn from others’ ways. Always speak up, or act if possible. I am constantly amazed at what non-Indigenous Australians learn when they start to learn about the brilliance, resilience, generosity, diversity and humour of Indigenous people and all of the stereotypes and biases they held are challenged. Sometimes this can take a while as confronting those sterotypes is difficult, but when the penny drops, it’s very interesting to see. For non- Indigenous Australians, learning that Blackfellas are not a second-class form of white culture, but a different and separate one, can also be confronting, but always worth it in the end. Leadership that rejects it and embraces the fullness of Australia’s cultural diversity, based in Indigenous culture and presence, every day, in every way, in everything it does. My boss, Distinguished Professor Larissa Behrendt. She is dogged and tireless at promoting justice for Indigenous people, and unfailingly generous. Generosity is my favourite trait. Mick Gooda is another person of enormous generosity, and consistency. Consistency is my second favourite trait. You’re not weird. Some of your attributes are normal for people of your cultural background, and your mix of cultural background also isn’t weird. It’s totally normal. Two words summarise my work in this area: listening and understanding. Most of the racism and hate stems from fear which is caused by lack of understanding and fear of the unknown. While calling racism out is important, it is equally important to listen to and understand valid or invalid concerns of those who may seem racist or prejudicial. During my time in Australia and especially in more recent times, I have seen an erosion of values and positive attitudes of tolerance, giving a fair go and empathy. While we have come a long way from the legalised racism of the “White Australia policy”, it has become commonplace to use racist and prejudicial language when describing migrants and refugees. The most worrying thing for me is that such language is sometimes expressed by politicians, both populist and mainstream. However, I still believe we are much better than most nations when it comes to ensuring equality under the law. Create more and more opportunities at the grassroots community level for people from different cultures to come together and get to know each other. While it is important for community and political leaders to keep doing activities which promote cultural diversity and counter prejudice, it will not be effective till everyday people are taken on that journey as well. In 2016, I was part of the team which organised Eid Down Under festival in Brisbane, our flagship Eid celebration program. The event was attended by over 15,000 people from all backgrounds. At the end of a long day at the festival, I heard a gentleman – who was from a European background – call my name in distance. I waited for him to get to me and he introduced himself. His name was familiar because he had, in the past, had a few exchanges with me on social media, and his messages were rather Islamophobic. He said to me, “I came to your festival to open my mind and I am happy I came out of my comfort zone to experience your culture”. That statement felt like best reward for all the sacrifices I have to make to volunteer my time in community service. As a Muslim Australian I draw strength and inspiration from my faith. Also, I was born in Gujarat, the western Indian state where Mahatma Ghandhi was born. His way of defeating injustice through non-violence is something which I truly admire and aspire to. I think I am especially privileged to be close to his great grandson, Mr Tushar Ghandhi who has given me advice and inspiration from time to time. To get out of my comfort zone and reach out to those I didn’t understand or held prejudice against. I have been privileged to work for over 40 years in the arts, education, the employment industry and human services, and through all these sectors my work has helped to build the language and imagery to inform and foster our cultural diversity. Multiculturalism is now indisputably our country’s cultural reality. Throughout my lifetime this reality has not always been the case. Neither should it be taken for granted. Cultural diversity is my life! I lead an organisation where over 50 staff, hundreds of volunteers and thousands of clients - all from small new and establishing migrant and refugee communities - work together and with the broader South Australian community in metropolitan Adelaide and small regional towns in South Australia, to showcase multiculturalism through practice. We all have a responsibility to protect, affirm and promote the values, institutions and practices that underpin our Australian multicultural society. And we all have the need and right to belong, thus strengthening Australia in its diversity. My son grew up in a bicultural privileged environment. He asked my partner, his father, an established 4th generation Australian, why I, his mother had to keep returning to Greece, her homeland, for every annual holiday? My partner instinctively understood and related that I, as so many other young children, had no choice whatsoever in making the journey to Australia as migrants and refugees. In supporting others to tell their stories, I had forgotten to relate and help my own children understand their own heritage. I find my greatest inspiration amongst the people that are my client groups; people from Africa, the Middle East, Asia, and Europe; and people who volunteer to help new arrivals, who themselves arrived as migrants at one point in time in Australia’s modern history. And I am always awed by the strength and courage of my Aboriginal colleagues and friends in their ongoing struggle for recognition. The Australian people need to become more active in promoting and practicing democracy rather than being reliant on their civic, economic and political leadership. We need to become sophisticated in our political activism to ensure the diversity of Australians can be seen in our councils, our parliaments, in our flagship institutions. Don’t be a workaholic! No one can change the world alone! Change requires collective effort. My professional experience is incredibly varied but has always revolved around the promotion of recognition and respect for diversity. From grassroots and international advocacy on Indigenous Peoples’ rights starting in my late teens, to now developing national collaborative approaches to improve health access and experience for migrant and refugee women—my contributions have been driven and shaped by my passion for equity, equality, and social justice. On a personal level, my work has been deeply enriching and rewarding. As an indigenous person and growing up as part of a recognisable minority, I know that racism, discrimination and bigotry can have a damaging effect on individuals and communities. And anyone at some point in their life can become a target. Racism causes great damage to a society as a whole—history teaches us that its consequences can be devastating, ultimately for all, and healing and reconciliation take generations. Standing up to racism is a part of responsible citizenship. There’s a lot that should and can be done, but I think an important part of it is self reflection. Developing awareness and appreciation of who we are as individuals, our identity, our personal history, our beliefs, and challenging our own assumptions is fundamentally important to recognising and appreciating diversity around us. My favourite stories would be those involving learning about one’s own culture. Due to tragic historic events, I didn’t become fully aware about my own—Crimean Tatar—culture until I was about 12 years old. We were forcibly detached from our land, and our ability to fully connect to our language, our traditions, our family histories. And I know that this late realisation and awareness of one’s cultural identity, and the ability to live it, is a reality for all too many Indigenous youth around the globe, including in Australia. The cultural reconnection to one’s self identify is an incredibly empowering experience. I’m fortunate to have known a number of outstanding women—talented, driven, and impactful—and their legacy inspires me to reach that little bit further every day. I grew up with three of them. My grandma was truly a matriarch who lived through incredibly tough times, including post-revolutionary repression, war, deportation, and as a result the loss of many of her loved ones and her homeland. Looking back at her story, sadly very similar to the stories of so many women of her generation in the community, I often fail to understand how she survived. Yet she was a self-starter, lived a meaningful life, brought up two amazing daughters (my mum and my aunt), and never stopped being optimistic. Everything I know about resilience and inner strength is from them. It is also through growing up in such an environment that I developed passion for gender equality and women’s empowerment, without even realising it to begin with. Looking back, I would remind myself that it would take time to develop my inner voice—my instinct, my intuition—but it’s important to start finding it early and, once found, always trust it. I feel privileged to be working at the Ethnic Communities Council of NSW as it is the ideal platform for me to work across a range of areas including government departments, non-government agencies, service providers, individuals and communities. It provides opportunities for me to be give voice and to represent the needs of our communities. As a child growing up in Fairfield, a predominately Anglo-Celtic suburb in south-western Sydney, I faced many challenges in my attempt to “fit in”. My parents had migrated from Greece just after WWII, and set up a small business, (like so many did in those days) with little English language competency and cultural understanding of the country they were building their future life in. Although there were many supportive and well-meaning friends and neighbours I experienced my share of racism when I started Kindergarten and could not speak a word of English. I spoke to everyone in Greek assuming that it was the language that everyone used! As a child in a school where very few children were from migrant homes I caught on very quickly that to “fit in” I had to adjust. I began ordering jam sandwiches and pies from the tuckshop at lunchtime. I had worked out that to be liked I needed to be able to communicate in English. With the absence of special English classes at school during that time I read books day and night to practice my English skills and to improve my proficiency. As years progressed and multiculturalism became the norm I chose to pursue a career path that reinforced the significance of multiculturalism in Australia in whatever context or work place I found myself in. It is so heart-warming to see the changing face of Australia and the culinary delights we can share with one another so openly. Fairfield, the place where I grew up, is an example of how diversity can immensely enrich Australia. It is true to say that we have made mistakes, and no doubt we will continue to do so. However, it is in our own charter to ensure that those who undermine multicultural Australia with hatred and vilification do not rise to threaten the social fabric of our society. I was moved when the then Prime Minister, Kevin Rudd, apologised for The Stolen Generations, and where as a country we made a stand for something we acknowledged was an injustice. This was an historical apology and a bitter sweet moment for me. Australians today are experiencing racism and I believe that we are all called to a civic responsibility to stand up to those who encourage xenophobia and racism. The public awareness campaign by the Australian Human Rights Commission known as “Racism. It Stops with Me” has been a hugely positive campaign in fighting racism. We need education in both our schools and workplaces, and a much larger stage for sharing stories. It is the human element of sharing our experiences and challenges that can break down prejudices and bring about cohesion. My advice would be to remain proud of my family, the cultural traditions and the language of my heritage. I would tell myself to not hold back or be ashamed of who I am and where my parents and family have come from…… and….. to embrace all the opportunities that Australia and the world has to offer. This is the advice I give to so many young people and young adults who I engage with in my work in the hope that they can grow to become human rights ambassadors in their everyday lives! 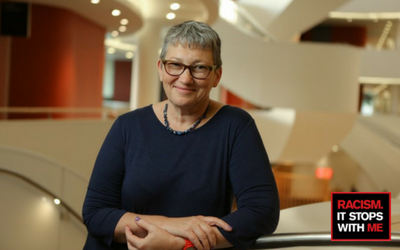 Director, Equity and Diversity at Western Sydney University and Hon. Professor at Sydney University. Sev is also immediate past Chair, Australian Multicultural Council and President of the Australian Council for Human Rights Education. One of the reasons why I have chosen to migrate to Australia were Australia’s multicultural policies and commitment to “fair go”. Australian cultural diversity has enriched my and my family’s life and formed our attitudes and knowledge. Since I arrived in 1975 Australia has become more interesting, vibrant and tolerant of difference. Also the governments’ multicultural policies and programs became more accepted by the vast majority of Australians over the time. Obtaining Australian citizenship, winning the America’s Cup, successes in the Olympic games, a range of government policies aiming on fair go and plenty of little but important things of everyday life in this beautiful country. Racism is like cancer that would destroy the fair go character of Australian society if not effectively controlled. Racism and bigotry deny equality to some of us. For any society to be successful it must have equality between its citizens as a foundation stone. Just talk with your neighbours, enjoy the benefits and fun of diversity and be fair in your dealings with other. Australia does it reasonably well now. But a focus on removal of any remaining access barriers to social and economic opportunities is the key. Difficult to say. But certainly, that racism in any form is bad for all of us. It denies dignity and hinders economy. That time I was welcomed to Australia, though I’ve been here for over forty years. Or after a giving a presentation, being commended on my 'grasp of the English language', by complete strangers, to which I've quipped: 'Yours isn't too bad. Keep it up'.